Traditional fruit machine type games are still popular and developer EGT has tapped I to this market many times, with one of the top titles being Shining Crown, where oranges, watermelons and cherries share the reels with a crown symbol that can create extra wins. The classic design extends to the standard 5x3 symbol layout and there’s just 10 paylines running across from the left side, with all permanently activated for a minimum wager of 0.10 per spin. 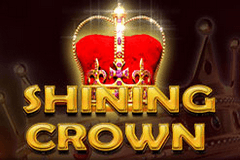 There’s the option to try out free Shining Crown video pokies at most online casinos, so anyone who likes to test a game before playing can do so, but like all EGT games, there’s a good return to player percentage and a guarantee of fair results. As well as wild substitutions from the crown, and some big scatter payouts, while there’s a couple of features common to EGT pokies. Players have the option to gamble wins of below a certain amount, and there’s the Jackpot Cards feature connected to the Club, Diamond, Heart and Spade rising progressive jackpots that are shown above the reels. The majority of wins are going to come from landing 3, 4 or 5 of the same type of symbol across any of the 10 paylines on adjacent reels from the left side, and the lowest value of these combinations are made by the orange, cheery, lemon and plum symbols, each of which pays 10, 30 or 150x the line bet when landing on 3, 4 or 5reels. We skip the fruit next, as a golden bell returns prizes of 20, 40 or 200x the line bet and then it’s back to the grocers with a watermelon and a bunch of grapes that are each worth 40, 120 or 700x. The top payouts come from a big red 7 symbol and when this classic icon appears across a payline, players are in for wins equal to 10x for just 2 of them, and 50, 250 or 5000x for 3, 4 or 5 on a line. There’s a couple of scatter symbols that won’t need to be across a payline to create a win. The $ symbol is valued at 50, 100 or 100x when it turns up in any 3, 4 or 5 positions, while the purple star is worth a straight 200 coin payout when it stops anywhere on the first, third and fifth reels from the left. Although it isn’t worth anything on its own, the crown symbol is the wildcard of the Shining Crown video pokie, so players who have matching symbols across the line, but there’s a gap in the sequence, could still get a win if the crown can fill in for the missing reel position. Lines of 3 matching symbols can also be extended across a further reel, which will bring in a 4 of a kind winning combination, or the crown can both substitute and stretch a winline at the same time. There’s no unique bonus games here, but players still have the gamble round and Jackpot Cards progressive feature. Any time a win is for less than 350 coins, a gamble can be taken with the prize, doubling the amount won of a correct red or black choice is made with the colour of a playing card. Getting the guess wrong loses the triggering prize, but if the player chose correctly, they can go on to try and double it again until the gamble high limit is reached. While the Jackpot Cards round isn’t going to be awarded every day, players who enter this random feature are guaranteed to win 1 of the 4 jackpots. Which prize depends on which paying card suit they first uncover 3 times from the 12 face-down cards that will be lined up on a second screen. Real money online pokies come in all shapes, sizes and themes, but classics like Shining Crown have remained popular throughout. It’s a simple game to learn and has very little in the way of distractions, so players can just decide on a bet size and get spinning away, collecting some reliable wins along the way. Of course, being awarded entry to the Jackpot Cards round would be a crowning experience, however even without this, there’s the potential to land some big payouts. The only real downside is that it’s not mobile-optimised, so punters will need to find a desktop casino before playing.